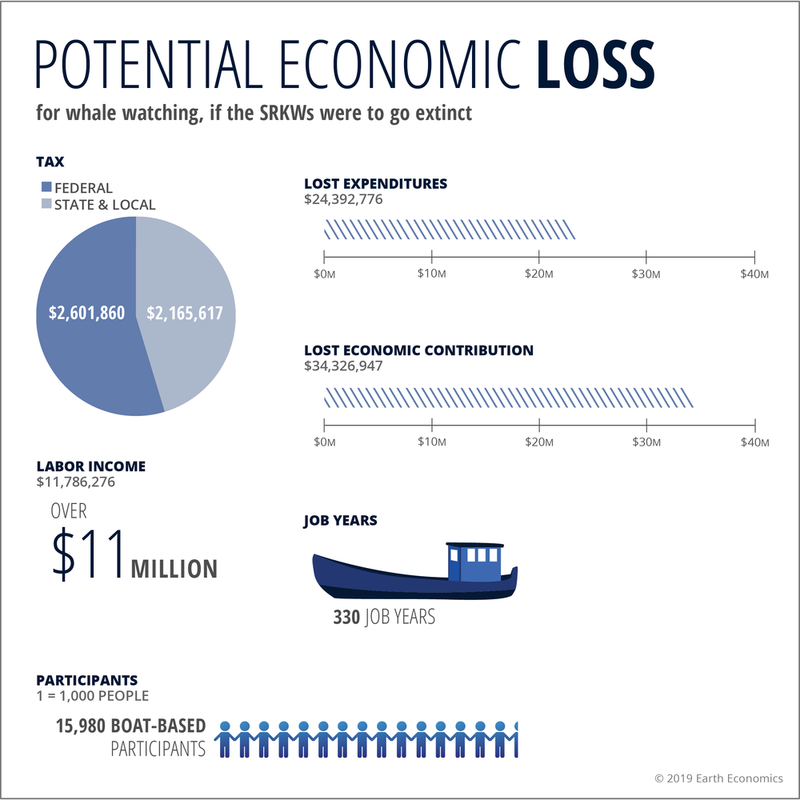 To better understand the economic incentives to invest in SRKW recovery, Earth Economics conducted an economic contribution analysis to estimate the value of whale watching in San Juan County. Our analysis focuses on boat- and land-based whale watching in San Juan County, the heart of Washington’s whale watching economy, but calculates the benefits to the entire Puget Sound Region. 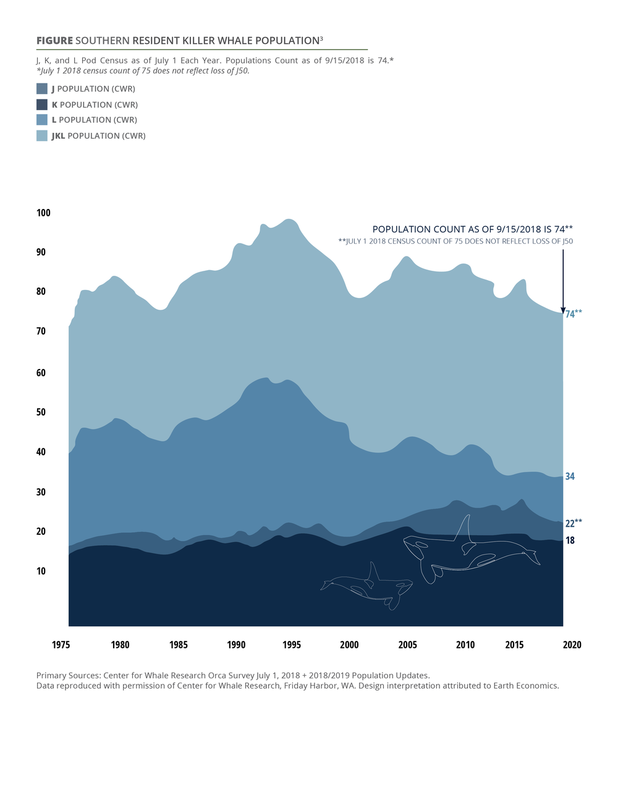 This study utilizes the existing estimates on the number of individuals that participate in whale watching in San Juan County each year and contributes critical new data to the conversation via the results of a survey designed and conducted by Earth Economics during the summer of 2018. Together, these sources present a more comprehensive picture of the economic impacts of whale watching in our region. The results show that whale watching participants who whale watch from boat-based tours or from terrestrial viewing points in San Juan County support over $216 million worth of economic activity in the Puget Sound Region every year. This activity generates more than $12 million in state and local tax revenue annually and supports over 1,800 jobs. In addition to valuing San Juan County’s whale watching economy as a whole, our survey design allows us to estimate the economic damages that would occur if the SRKW population were to collapse. Using sightings data to predict the decrease in whale sighting days near the San Juan Islands, we asked survey respondents to predict their behavior, should their chances of seeing an orca decrease by the proportion that is expected if the SRKWs become extinct. 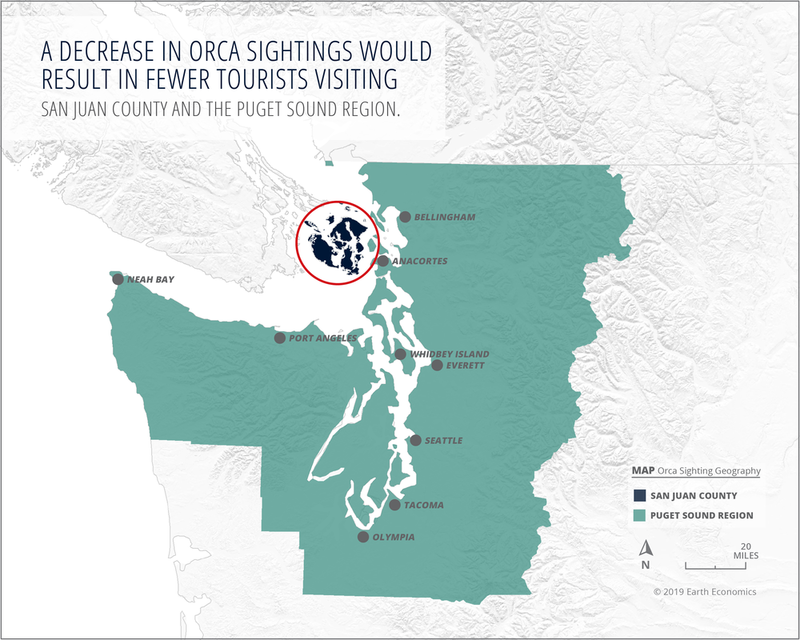 In this alternative scenario, 33% of non-local, boat-based whale watching participants said they would no longer choose to visit the Puget Sound Region, equating to an annual loss of $34 million in economic activity, $2.2 million in state and local tax revenue, and 330 jobs. While these results are significant, they are also likely an underestimate of Washington’s whale watching economy and the economic losses that would occur in the face of SRKW extinction, because our analysis focused explicitly on whale watching occurring in San Juan County, and we know that the industry extends far beyond that border. Van Deren, M., Mojica, J., Martin, J., Armistead, C., Koefod, C. 2019. The Whales in Our Waters: The Economic Benefits of Whale Watching in San Juan County. Earth Economics. Tacoma, WA. This project was supported by the SeaDoc Society through Karen C. Drayer Wildlife Health Center, School of Veterinary Medicine, University of California, Davis.